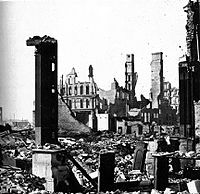 The Great Chicago Fire was a conflagration that burned from Sunday, October 8, to early Tuesday, October 10, 1871, killing hundreds and destroying about 4 square miles (10 km2) in Chicago, Illinois. Though the fire was one of the largest U.S. disasters of the 19th century, the rebuilding that began almost immediately spurred Chicago's development into one of the most populous and economically important American cities. On the municipal flag of Chicago, the second star commemorates the fire. Even to this day the exact cause and origin of the fire remain uncertain. The fire started at about 9 p.m. on Sunday, October 8, in or around a small barn that bordered the alley behind 137 DeKoven Street. 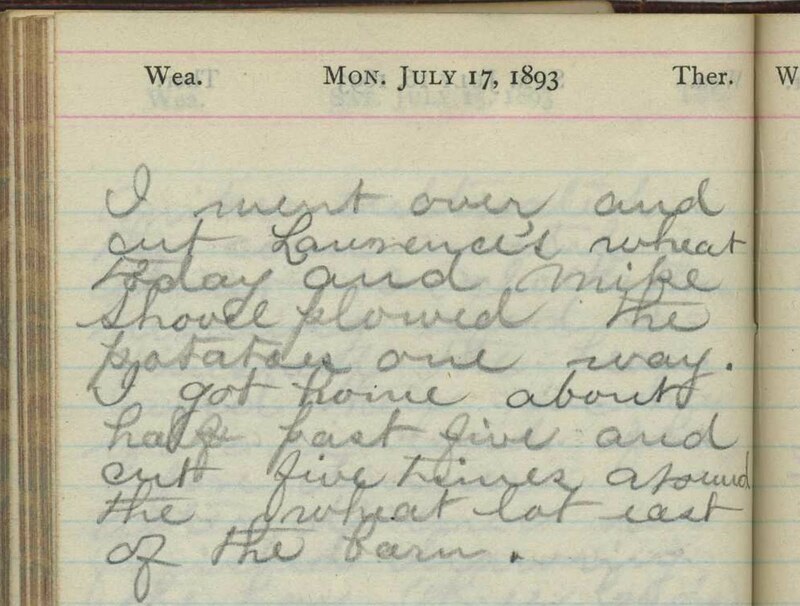 The traditional account of the origin of the fire is that it was started by a cow kicking over a lantern in the barn owned by Patrick and Catherine O'Leary. Michael Ahern, the Chicago Republican reporter who created the cow story, admitted in 1893 that he had made it up because he thought it would make colorful copy. 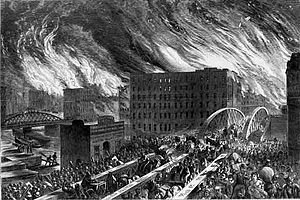 The fire's spread was aided by the city's overuse of wood for building, a drought prior to the fire, and strong winds from the southwest that carried flying embers toward the heart of the city. The city also made fatal errors by not reacting soon enough and citizens were apparently unconcerned when it began. The firefighters were also exhausted from fighting a fire that happened the day before. The firefighters fought the fire through the entire day and became extremely exhausted. Eventually the fire jumped to a nearby neighborhood and began to devastate mansions, houses and apartments. Almost everything that crossed the fire's path was made of wood that had been dried out for quite a while. After two days of the city burning down it began to rain and doused the remaining fire. It is said that over 300 people died in the fire and over 100,000 were left homeless.